A riveting glimpse of life and love during and after World War II--a heart-warming, touching, and thoroughly absorbing true story of a world gone by. 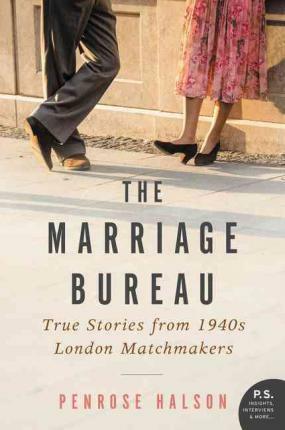 In the spring of 1939, with the Second World War looming, two determined twenty-four-year-olds, Heather Jenner and Mary Oliver, decided to open a marriage bureau. They found a tiny office on London's Bond Street and set about the delicate business of matchmaking. Drawing on the bureau's extensive archives, Penrose Halson--who many years later found herself the proprietor of the bureau--tells their story, and those of their clients. From shop girls to debutantes; widowers to war veterans, clients came in search of security, social acceptance, or simply love. And thanks to the meticulous organization and astute intuition of the Bureau's matchmakers, most found what they were looking for. From shop girls to debutantes, widowers to war veterans, clients came in search of security, social acceptance, or simply love. And thanks to the meticulous organization and astute intuition of the Bureau's matchmakers, most found what they were looking for. Penrose Halson draws from newspaper and magazine articles, advertisements, registration forms, film, record cards, ledgers, photographs, letters, and books by the proprietors themselves to bring the romance and heartbreak of matchmaking during wartime to vivid, often hilarious, life in this unforgettable story of a most unusual business.